I first spotted a Dee by Dalia shirt at a dinner, there was something very expressive about the relatively simple white shirt. A tasteful combination of starched Japanese cotton and minimalist details that almost gave you the basics of sophistication and style but allowed you to fill in the blank of your own life experiences. I am a _________, sophisticated and stylish woman in a Dee by Dalia shirt. Like a perfect fragrance, the shirt blends with your character and highlights it. As I arrive at the impressive Dubai Design District, D3, I am reminded of how insignificant one can feel in this fabulous city. I walk into the Dee by Dalia space however and am instantly enveloped by the fuzzy feeling of home. The spirit of her shabby-chic atelier is warm and welcoming. It is also clearly an authentic reflect of who Dalia is. No fancy mirrors and ultra modern design for this designer. The place is raw which makes it courageous. Oh how comfortable it would be to hide behind some seriously impressive furnishings, and let the pieces talk of who you are… It takes a certain confidence to go the eclectic route and Dalia’s atelier is just that. Enter Dalia, an exuberant yummy mummy with some serious accolades under her belt, her three year old company has dressed some impressive personalities and more importantly carved a niche for her on the regional fashion scene. 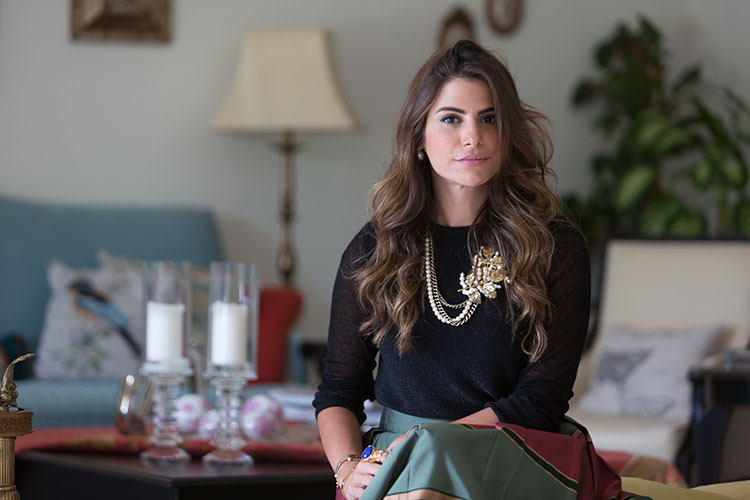 In a pair of loose-fitting shorts and casual shirt she is a vision of Dubai’s high-flying lifestyle. Her endless legs baked to perfection under the DXB sun. There is something more delicious than her caramel tan however, its her brain! Dalia’s mind is delightful and my brain instantly wants to be besties with hers. That’s not to say that I didn’t ask her all the trivial questions, that would be a lost opportunity… Her two favorite Dubai restaurants are La Petite Maison and Zuma, her products of the moment ; Keihls… As for her off-duty rituals they are gym and beach, which I guess explains the fabulously svelte and tanned legs ! Her emotional intelligence makes our conversation that much more interesting. She transitions seamlessly from conversation about her two boys, to her opinions on fashion design and why women do the things that they do. She explains to me how she never considered fashion design as a career, she was part of the corporate investment banking world for more than 6 years. Perhaps that made her entry into the world of fashion an intelligent one, she found a gap in the market and believed she could fill it. She then studied fashion design at London College of Fashion before taking the plunge. Dee by Dalia started off as a unique shirting home project for working women looking for a twist on the traditional men’s shirt. Three years later she has an atelier at D3 and presentations at Fashion Forward Dubai. But you need more than just a good idea and a background in finance to make you successful in Dubai. Dalia brings to the table a likability that is imperative to the process. Fabulous Dubai is immense in its people, activities and cultures. To have impact you need to have the ability to disarm people with your common humanity… You need to break it down to more manageable pieces and Dalia is a pro.